With all the predictions of very cold weather, it is still fine here. While, I have been yearning for hot soup, instead today, I did want a salad which was on the menu in our WwDH group. I can't remember ever having this salad. It is a treat with so many different ingredients. I did leave out the olives because we are not much of an olive eating family. 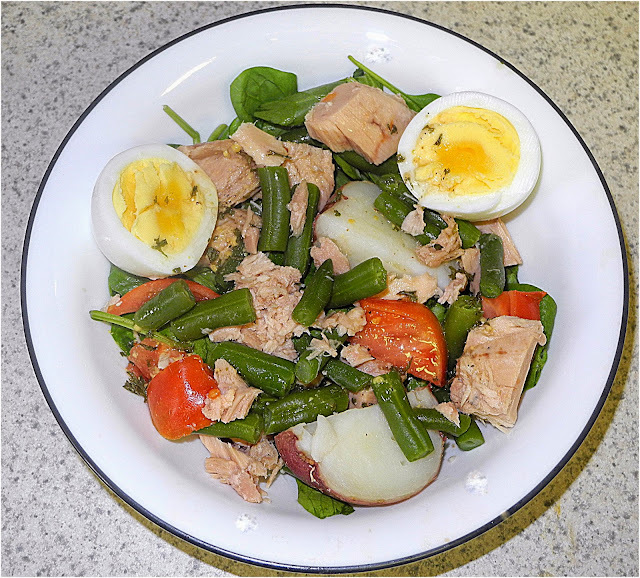 With green beans, tomatoes, tuna, potatoes, spinach and eggs, this was a potpourri of flavors. The dressing was a simple one but just right for this mixture. Interesting use of words, in Science I am teaching my class the difference between a mixture, element and compound. They will enjoy that I ate a mixture for lunch. I enjoyed this and can see making it again. Check out the other Donna Hay cooks. Beautiful! I love that you connected your science teaching. I am a maths teacher and sometimes I have blogging ideas that involve maths... but I don't always follow through with them. Your Salad looks delicious! Hope you are having a great day and thanks so much for sharing this awesome post with Full Plate Thursday.